While shopping I purchased some cranberries and really wasn’t sure what I was going to do with them. I saw a recipe on Facebook for cranberry orange sangria and I was like “this is perfect”. It looked so delicious and refreshing. I made it for the first time for my guest on Christmas and they loved it. The first batch was gone in a flash. So fast that I didn't get any pictures. I decided to make it as well for my aunts birthday dinner and this time actually garnish the cups for all of my guest. It's something about receiving a pretty garnished drink that makes me feel as if I’m on a tropical island somewhere. This time my guest were in all over their drinks. I even froze some cranberries on a wooden sewer instead if using ice cubes. My guest loved how cute the frozen cranberries were. Might I add this drink taste as good as it looks. Me being me, I didn’t use the wine recommend in the recipe, of course, I wasn't running out to the store. I believe that any white wine would do. Typically, when I make regular sangria, I purchase the sangria wine and just add the fruit and sugar. I love how simple this recipe is to make. Plus, having pretty straws around just make it a bonus. 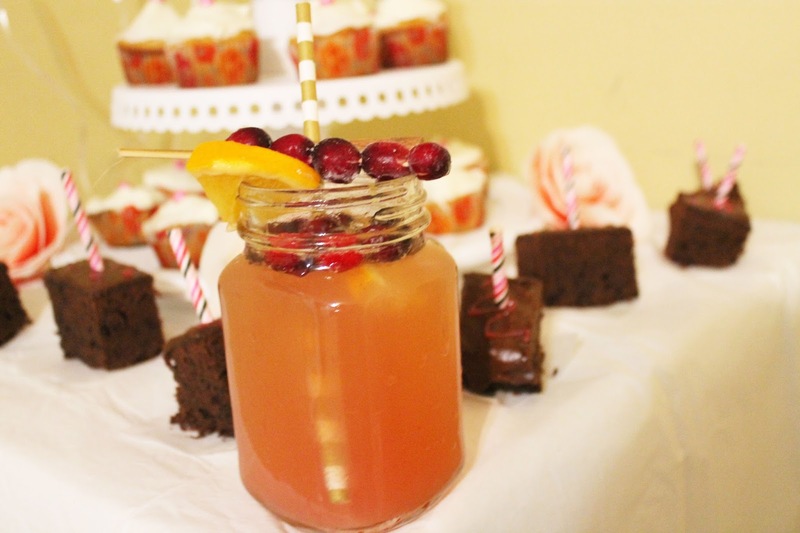 Have you ever tried cranberry orange sangria? Are you a sangria fan? Stir together cranberry juice, sugar, orange slices, slices and cinnamon sticks, 1/2 of the bottle of wine in a large pitcher. Cover and refrigerate for 30 minutes (or up to eight hours). When you are ready to serve the sangria, add the ginger ale to the cranberry juice mixture and stir briefly to combine. Serve immediately in glasses, topped with optional garnishes.